In the movie Jigsaw, AKA Saw 8, and originally entitled Saw Legacy – yes, we all knew that the final Saw was not really going to be the end of that franchise – dead bodies begin to turn up all over the city, each meeting their demise in a variety of grisly ways. All investigations begin to point the finger at deceased killer John Kramer. 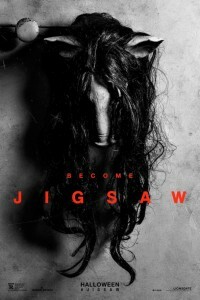 Thirteen years ago on Halloween weekend – SAW and the character of JIGSAW introduced the world to a new face of horror. For seven straight years “If it’s Halloween it must be SAW” was a holiday tradition. This October 27, Lionsgate and Twisted Pictures proudly present JIGSAW! After a series of murders bearing all the markings of the Jigsaw killer, law enforcement find themselves chasing the ghost of a man dead for over a decade and embroiled in a new game that’s only just begun. Is John Kramer back from the dead to remind the world to be grateful for the gift of life? Or is this a trap set by a killer with designs of their own? A Lionsgate release, Twisted Pictures presents, a Burg/Koules/Hoffman production.